Canada is playing host to a slew of foreign cybercriminals, making it one of the top countries in the world for hackers looking for a destination to plant their malware, phishing and command and control (C&C) centres. Although the U.S. was still the number one country as a source of cyber threats, the number of reported C & C attacks within Canada is now up 83 per cent this year. That ranks it as the eighth country in the world for that form of cybercrime, according to the third annual report on cybercrime in Canada from security solutions provider Websense Inc. 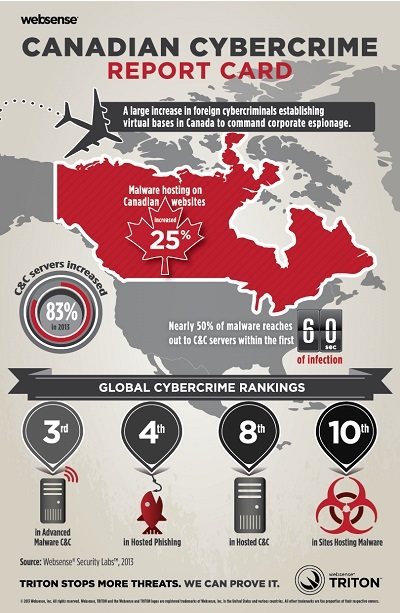 Yet Canada is actually third in the world when it comes to the volume of advanced malware and C & C servers, which is the type of software used to commit corporate espionage. C & C allows hackers to issue instructions to malware, including what kind of data to try to steal and where to send the information once the malware gets it. The number of Canadian websites falling victim to malware – most of them completely legitimate, like the content management platform WordPress.com – also increased by 25 per cent this year, slotting Canada into the 10th position of all countries hosting malware. Although phishing dropped by 67 per cent over the last year, Canada is still fourth in the world when it comes to hosting phishing sites. The phishing itself is also becoming increasingly sophisticated – and unfortunately, other kinds of clever hacking techniques are becoming more and more common across the board, says Fiaaz Walji, Canadian country manager for Websense. Part of the reason why Canada is such an appealing target among hackers is that we have a good reputation for safety and security. IT departments within Canada aren’t likely to question emails coming from a .com or .ca address, nor are other countries that regularly do business with Canadian firms. On top of that, Canada has weathered an economic downturn much better than European countries, and Canadians’ relatively stable income can also attract hackers, Walji says. And on a more cultural level, Canadians are known for being nice, friendly people, easy to do business with and perhaps, easy to take advantage of, Walji says. To better protect their companies’ data, IT departments need to take a two-pronged approach, considering the sides of both technology and education, Walji said. “You need security that looks at in-bound and out-bound … Stuff will get in, which is fine. But if stuff gets in, make sure you have something watching things go out. It’s the year of advanced malware. These are very smart pieces of malware, they’ll sit there and wait for you to hit a spot they want you to hit, and then they’ll ping home … with a banking site and password,” he said. Walji added he’s seen the number of incidents drop dramatically once companies educate their employees about what’s acceptable and safe and what isn’t. Yet government and policymakers have a role to play, too, Walji says. He believes Internet service providers need to be more vigilant against hackers, but law enforcement needs more resources to chase hackers and set more serious precedents. Yet once law enforcement catches these hackers, it’s difficult to prosecute because laws governing Internet behaviour tend to be regionalized. That’s a problem when hackers are reaching all over the globe to attack individuals and corporations. And the problem is, security may only become a bigger issue from here on out, Walji adds, especially with BYOD becoming a bigger buzzword within IT departments. “I get asked every year [if it’s getting worse],” he said, adding that as Canada’s infrastructure and reputation continue to do well, hackers will only keep coming.